Free Paper, “MON” Has Been Published. 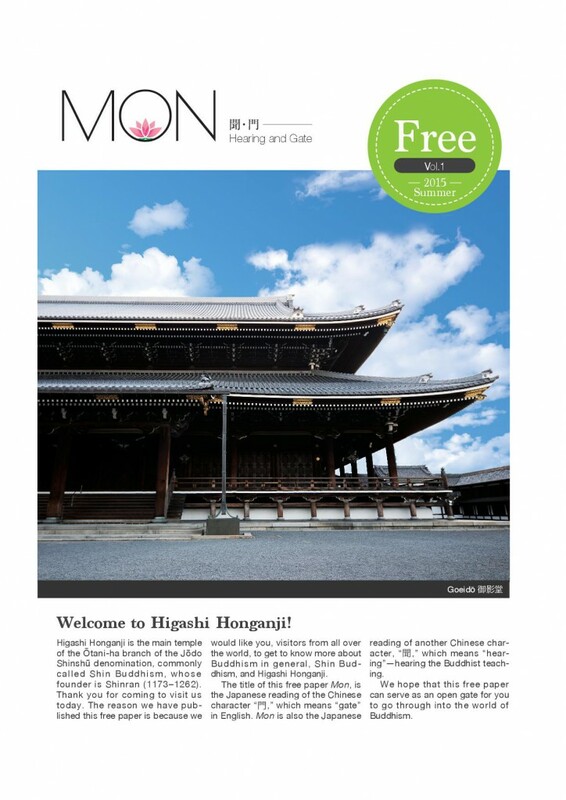 This free paper, “MON” has been published because we would like you to get to know more about Buddhism in general, Shin Buddhism, and Higashi Honganji. 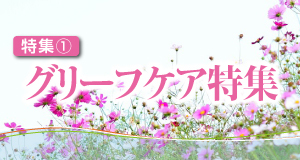 The title of this free paper Mon, is the Japanese reading of the Chinese character “門,” which means “gate” in English. Mon is also the Japanese reading of another Chinese character, “聞,” which means “hearing”—hearing the Buddhist teaching. We hope that this free paper can serve as an open gate for you to go through into the world of Buddhism. You can find the PDF of “MON” above and you can also read the text of the paper below. Higashi Honganji is the main temple of the Ōtani-ha branch of the Jōdo Shinshū denomination, commonly called Shin Buddhism, whose founder is Shinran (1173–1262). Thank you for coming to visit us today. 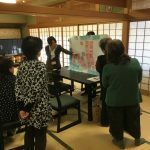 The reason we have published this free paper is because we would like you, visitors from all over the world, to get to know more about Buddhism in general, Shin Buddhism, and Higashi Honganji. 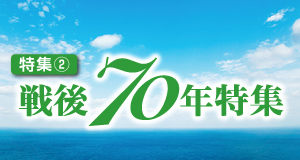 The title of this free paper Mon, is the Japanese reading of the Chinese character “門,” which means “gate” in English. Mon is also the Japanese reading of another Chinese character, “聞,” which means “hearing”—hearing the Buddhist teaching. We hope that this free paper can serve as an open gate for you to go through into the world of Buddhism. Buddhism is a way of life that was developed over 2,500 years ago in India. Since then, it has spread throughout Asia and into other parts of the world as well. Buddhism as it is practiced today has three major streams. Theravāda (Teaching of the Elders) is said to be the oldest stream of Buddhism and can be found in southern Asian countries like Sri Lanka and Thailand. Mahāyāna (Great Vehicle) is the Buddhism of northern Asian countries like China, Korea, Vietnam, and Japan. The third stream is Vajrayāna (Thunderbolt Vehicle), the Buddhism of Tibet. Buddhism developed out of a wish held by the Buddha to overcome the suffering he experienced in life. It was not his intention to establish a new religion. He did not establish churches. He did not build altars nor organize rituals. What he taught was based upon what he learned from others, but more importantly, from the experiences in his own life. The Buddha was born as Siddhārtha Gautama, a prince in the kingdom of the Śākya clan located close to the border between present-day India and Nepal. Destined to be the future king, he was given all of the education and training befitting him, but also sheltered from the unpleasant experiences of life. He was so sheltered, in fact, that he knew nothing of such everyday experiences as illness, aging, and death until he was a young man. He then encountered a monk with a peaceful and fulfilled countenance, who was walking the spiritual path, searching for answers to the mysteries of life. In this monk he saw his future. Rather than succeed his father as king, he found a more important quest, of finding a way to end suffering. At age twenty-nine, he left the palace, leaving behind his wife, son, parents, and all the status and comforts of royalty, and embarked on his spiritual journey. He learned from the sages, the wise men of the forests, and eventually joined a group of five monks engaged in severe ascetic practice. Through subjecting himself to all types of austerities, including fasting and meditation, Gautama continued his search for spiritual insight. After six years, he was reduced to flesh and bone, on the verge of death. Reflecting on his life to that point, he realized that he had been living at the two extremes and that neither was conducive to understanding the meaning of life. It is here that he discovered the Middle Path, avoiding the extremes of luxury and self-renunciation. With clarity of thought, he sat under what was to become known as the Bodhi tree to reflect on true nature of life. It was through this period of meditation that Gautama watched a countless number of causes and conditions dependently arising every moment to constitute human life. He realized that it was our ignorance that became the causes and conditions leading to human suffering. Gautama was awakened to the truth—the Dharma. In order to share his awakening and save people from their suffering, Gautama first encountered the five monks with whom he previously practiced. They took refuge in Gautama’s teaching and became his disciples. At this point, the Three Treasures were established—the Buddha (the person who teaches the Dharma), the Dharma (the truth that has become the teaching), and the Saṅgha (the community of people who follow the teaching). The Buddha also became known by the reverential title Śākyamuni (the sage of the Śākya clan). There are causes to that suffering. Such suffering can be overcome. The Eightfold Path is the way to end suffering. The original word for suffering is dukkha, often expressed as a wheel with its axle out of kilter. The wheel, a metaphor for our lives, does not turn smoothly because its essence is off-center. Before his awakening, we can presume that the Buddha saw life as we do, that any experiences of suffering were the result of external forces. He lists the principal causes of suffering as birth, illness, aging, and death. He saw that the one undeniable truth is that life is impermanent, and that it is our resistance to the transient nature of life that brings about suffering. No matter how hard we try to hold on to our health, we become ill; no matter how hard we try to hold on to our youth, we grow old; no matter how hard we try to hold on to the people we love, death brings separation and ultimately our own demise. His realization, though, was that impermanence is neutral; the changes themselves are not necessarily good nor bad in and of themselves. The cause of suffering lies totally in ourselves, in our reactions to those changes and in our ignorance of the reality of impermanence. Since we are the cause of our own suffering, suffering can be overcome. The way to overcome that suffering is the Eightfold Path, the fourth aspect of the Four Noble Truths. The Eightfold Path which encourages right understanding, thinking, speech, conduct, livelihood, endeavor, mindfulness, and meditation, is meant to provide us with a new perspective of life. It promotes wisdom and compassion in our interactions with the world about us, and ultimately leads to finding happiness and meaning in our own lives. The Buddha attained his awakening at the age of thirty-five, and for the next forty-five years, he shared his understanding of life with everyone he encountered. The truths he awakened to came from his own experience of life, not from any revelation from the heavens. As a result, there is no acknowledgment of gods. Buddhism is focused on this life and has no definitive view of creation nor afterlife. Heaven and hell, therefore, are conditions we create here and now and are not a reward or punishment after death. In its essence, therefore, Buddhism does not fit into the normal definition of religion. There are no commandments nor beliefs its followers must hold to. Simply stated, Buddhism is the encouragement of a way of life that enables us to discover the meaning of our birth as human beings and the true joy of living. Shin Buddhism or Jōdo Shinshū is a Mahāyāna Buddhist teaching that was established by Shinran Shōnin (1173–1263), a Buddhist priest in Japan. Its foundation is based on three sūtras (recorded sermons of Śākyamuni Buddha), the Larger Sūtra of Immeasurable Life, the Smaller Sūtra of Immeasurable Life (also referred to as the Amida Sūtra) and the Meditation Sūtra. These are the principle teachings of what is called Pure Land Buddhism. The Pure Land tradition was born in India and expanded greatly in China, but did not develop into a separate denomination until the twelfth century in Japan with the appearance of Hōnen Shōnin (1133–1212), Shinran’s teacher. Hōnen was a student at the Tendai monastery at Mt. Hiei in Kyoto. Dissatisfied with the traditional monastic path of climbing up the ladder to enlightenment—which made Buddhism inaccessible to most people—Hōnen chose the teaching of the nenbutsu, the recitation of Namu Amida Butsu (“I take refuge in Amida Buddha”). He left the monastery in order to share the teaching with the everyday, common people for whom traditional Buddhism was inaccessible. Shinran shared a similar path. He entered the monastery at the age of nine, then spent twenty years in study of the Tendai teachings. The experience, however, left him empty and feeling far away from the awakening the Buddha described. He left the monastery in 1201, and joined the Saṅgha established by Hōnen. 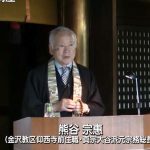 In his teacher, he saw a totally different model of a Buddhist teacher, a person who considered himself first and foremost a bonbu, an ordinary person whose mind was clouded by ignorance and filled with self-centeredness, and exhibited total humility in all aspects of his life. Through Hōnen and the teaching of the nenbutsu, Shinran discovered a path of Mahāyāna Buddhism open to him. He wrestled with the fact that the gaining of knowledge and practice during his two decades on Mt. Hiei had not made him a better person. In fact, that experience had left him more arrogant, feeling superior to those who studied and practiced less than he. As a result, it left him further and further from the awakening he saw in the model of Śākyamuni Buddha. In Hōnen and in the teaching of nenbutsu, he realized that Buddhism is truly universal, and open to anyone who could come to an honest evaluation of himself as a being controlled by ego. Anyone who visits Kyoto will, at some point, come across the name Higashi Honganji, whether on the map or while walking near Kyoto Station. 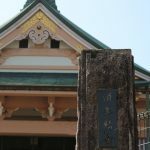 However, few tourists—or even local residents—are aware that the temple has a second, official name: Shinshū Honbyō (真宗本廟). While this name literally means “The Principal Mausoleum of the True Pure Land Teaching,” the temple’s actual function and significance for the school’s followers is a bit more subtle than simply that of an important grave or a pilgrimage site. The Chinese character byō (廟) originally stands for a shrine containing images of family ancestors. Indeed, the Founder’s Hall at Higashi Honganji was built to enshrine the image of the school’s founder, Shinran, and to this day, the Ōtani Denomination’s most important ceremonies and events are held before this image. However, the actual spot where Shinran’s remains are buried is located elsewhere in Kyoto—at the Ōtani Mausoleum in the east part of the city, near Maruyama Park. Higashi Honganji, or Shinshū Honbyō, is in fact not supposed to be a physical mausoleum enshrining the body of Shinran, but a spiritual one housing his living teaching. The temple actually started out as a gathering place for Shinran’s disciples, in which they would remember the late teacher while continuing to listen and discuss the teaching he had left for them. It is this function that has always defined the temple and given it its special importance to the followers. At the center of the temple are the Founder’s Hall, which is dedicated to listening to the teaching, and Amida Hall, which is dedicated to honoring the teaching’s spiritual significance. These, together with the other buildings on the precincts, combine to create a place where Shinran’s legacy is not only evoked as a memory by his image, but also practiced as a constantly evolving reality.